The basis of the system is to create two email accounts, the first for storing known junk mail (SPAM), the second for storing mail that was incorrectly marked as junk (HAM) by the bayesian filter. On the server, set up local accounts named “junkmail” and “notjunkmail”. Turn off all services except email for these accounts for security’s sake. In your email client, add these two accounts. Set up your rules for processing SPAM so that messages marked as spam are sent to the “junkmail” account’s inbox. 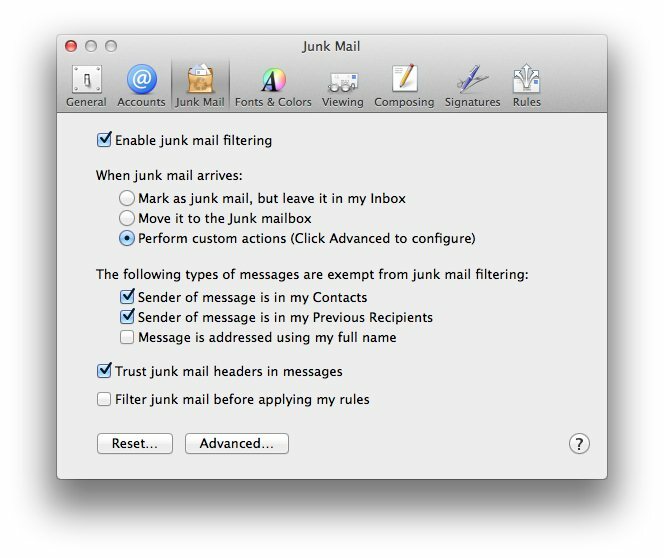 Now, when junk mail comes in that your email client correctly identifies, it will be automatically placed in the “junkmail” account’s inbox. And when you manually mark a message as junk mail, it will also be moved there. 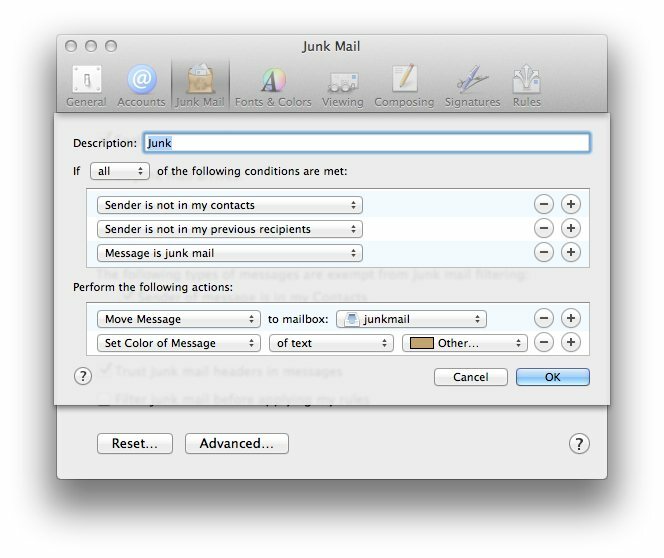 Any miscategorized messages (i.e., not junk mail) can be manually moved into the “notjunkmail” inbox. Set up spamtrainer to launch at startup, and run nightly issue the following command. When prompted for the name of your email store and the two SPAM and HAM accounts, just accept the defaults. I chose to have a report emailed to me nightly, and to have the email stored in the SPAM and HAM accounts deleted. At the end of the script run, copy the command it provides and execute it to force spamtrainer to run immediately. That’s it! You’re on your way to less email. This entry was posted in Front Page, How-To, Technology and tagged Email, Mac OS X Server, Mavericks, Sendmail, Spam by Chris Brewer. Bookmark the permalink.